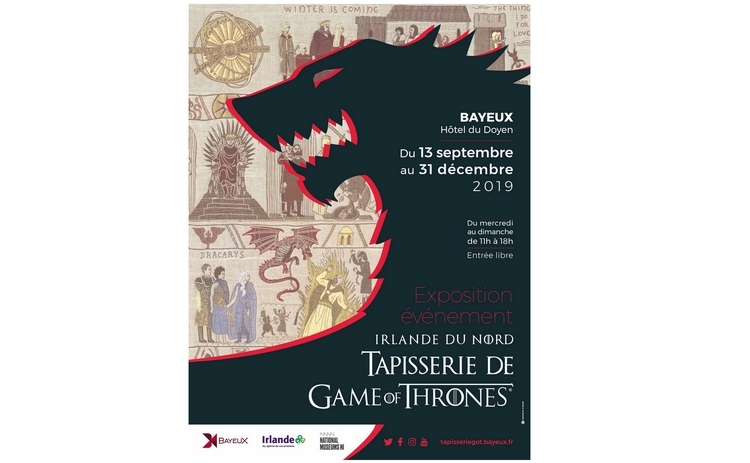 On the occasion of the OCS broadcast in April 2019, the eighth and final season of the award-winning series of HBO®, the famous “Tapestry Game of Thrones®” of Tourism Ireland will travel to Bayeux next September, to be exhibited next to the genuine Bayeux Tapestry. Exhibited at the Ulster Museum in Belfast since July 2017, this monumental artwork, nearly 80 meters long, will be enriched by the eighth and last season of the serie, during its highly anticipated global broadcast in April. She will then write her own saga leaving for a very symbolic journey to conquer its origins, in the city of Bayeux in Normandy … Due to its exceptional size, it will be presented, not at the Bayeux Tapestry museum directly, but at the Hôtel du Doyen near the cathedral, rue Lambert-Leforestier.